Summon: Give all enemy creatures in this lane -1/-0. Karthspire Scourge is a rare Willpower creature card. It is part of the Heroes of Skyrim expansion. This card's summon ability applies the Flying Terror card effect. 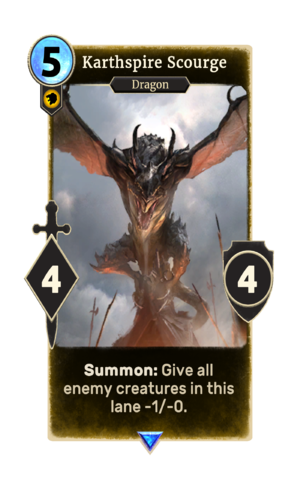 This card may be a reference to the dragon that appears at Karthspire Camp during Alduin's Wall in Skyrim.